For over 30 years we have been providing renovation services, including windows, doors, vinyl siding and vinyl decking to the Edmonton area. As a local business with an A+ rating with the Better Business Bureau, our core philosophy is to provide the best service and workmanship. Thanks to our outstanding customer reviews on Homestars, we’ve been honoured as “Edmonton’s Best” three years running. Our owners have a hands-on approach to the business and are often on-site. Plus, our team members are all employees, not sub-trades. Every person working on your vinyl decking project has been trained by the owners. This means they have the same philosophy for quality workmanship and excellent customer service that we are known for. Our entire staff all feel the same – it is vitally important we do the job right first time! We’ve selected Tufdek vinyl decking as our outdoor vinyl flooring of choice because it is a high-quality waterproofing product that is durable, stylish, and has a proven history. 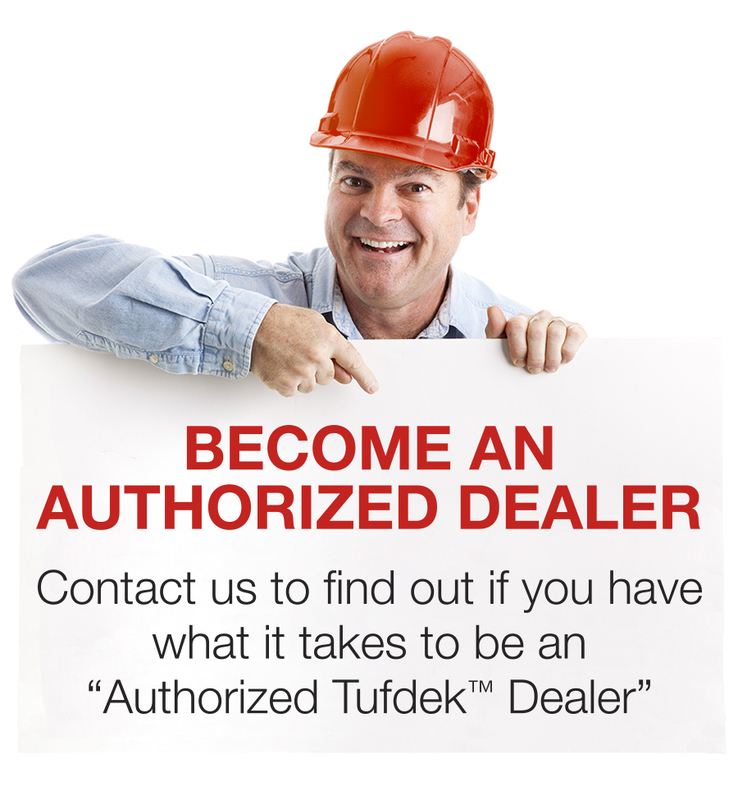 Tufdek vinyl also has a fantastic warranty. We are proud to be a Tufdek vinyl decking dealer in Edmonton AB. As such, we are licensed to sell and install Tufdek outdoor vinyl flooring and all related products. Tufdek waterproof vinyl is ideal for any outdoor walkable surface and an excellent choice for patios, sundecks, roof decks and more. Tufdek vinyl decking also looks great – take a look at Tufdek’s vinyl deck photos. If you’re looking for a great outdoor waterproof deck surface, let’s talk about Tufdek vinyl decking. With Tufdek, you can transform any outdoor walkable surface into a durable outdoor waterproof living space that your family will love for years to come. It is our mandate to ensure exterior renovation projects, including Tufdek vinyl installations, are completed on time, on budget, and looks great. As a local renovation and vinyl decking company, we share with our employees TEAM values that ensure your complete satisfaction. We believe in Teamwork, and strive to ensure our culture is supportive of everyone professionally and personally. We also seek to Empower our team by encouraging new ways to grow our company and employees. We hold ourselves Accountable for our workmanship. We also believe in Morality and value honesty and integrity. All people working for us are employees. We do not employ sub-contractors. We strive to provide excellent customer service and quality workmanship on all our vinyl decking installations. Our philosophy for customer service has helped us achieve a fantastic reputation in the Edmonton area. “Friendly, small local business” – C.M. If you still have questions about how to waterproof your deck with Tufdek vinyl, visit the Tufdek FAQ page. Let us show you how Tufdek vinyl, the world’s toughest waterproof vinyl decking, can protect your outdoor walkable surfaces against the harsh northern Alberta weather. For more information about our vinyl decking company or to order Tufdek vinyl, call the Tufdek office toll free number at 1-877-860-9333 or fill out the following contact form.